Andrew Farr, PR manager for Classic Collection, discusses his recent holiday to Tunisia and what it was like to holiday in the country in the wake of the June terrorist massacre. "Perhaps the most surprising aspect of my August trip to Tunisia, was not how few tourists I encountered but how full the hotels were, with the exception of the hotel in the middle of Tunis medina in which I had elected to spend my first of twenty-one nights. That was so empty that I had to phone the owner, Mounir, to come to open it for me. I’d reserved online and been rather optimistic with my arrival time. When I failed to keep the appointment with my ETA, Mounir had assumed that this British tourist had taken FCO advice and decided not to travel. Demonstrating the hospitality for which Tunisia is renowned, Mounir pitched up at 2.30am with a chilled bottle of water and an electric fan, both of which came in handy, given that, even in the early hours, it was still 29 degrees centigrade. He explained that he had beds for more than 40 guests, but if business had been difficult after the March incident at the Bardo Museum, things had become impossible following the events of late June on a beach in Sousse. I was his only guest. He was very worried for the future. His hotel is a fine old palace and income is needed for the upkeep. One bed night at 30 dinars (£10) was not going to cover that. He felt that the tourists would never come back. There were no such problems in Hammamet. The hotels were full, although with Algerians and Tunisians, and only for August. And as hotel owners, taxi drivers and Hamouda in the Brothers’ Shop in Hammamet medina pointed out, they don’t spend at the bar, have their own cars so won’t need a taxi and are unlikely to purchase souvenirs. Summer was not going to be very profitable and winter was going to feel extremely long. The lean times would be starting on September 1 and not ending until, well, who knows when? 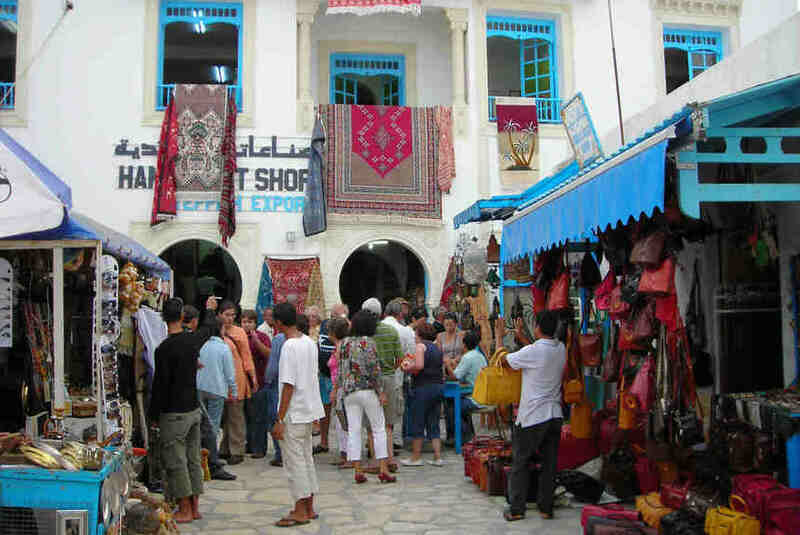 There was a frustration bordering on anger and a sense of betrayal of the Tunisian people, so many of whom depend upon tourism to make a living, with the advice from the FCO about all but essential travel to Tunisia from the UK. The Tunisians to whom I spoke were quick to point out that other countries had suffered similar terrorist outrages, and in the wake of those, travellers had been actively encouraged to visit. After 9/11 were people told not to visit New York? Quite the reverse. Why in Tunisia’s case was the advice so different? I, for one, had no qualms about visiting this corner of North Africa. Whilst respecting the fact that the FCO don’t impose travel bans for no reason, I decided that my holiday was ‘essential’. Whilst there I never felt unsafe. The military police offered to accompany me to my hotel in Tunis. I declined. I hired a car. I took the train. I had a dedicated armed police ‘watch’ on the beach; admittedly by default, as there were no other tourists with whom to share him. And I was so happy to have visited. The beaches were as fabulous as ever, the weather consistently superb, the hospitality overwhelming, the home cooking full of flavour, the wines much improved, the tourist sights deserted and the very favourable exchange rate a tremendous boost to my holiday spending. A holiday to Tunisia represents astonishingly good value for money; I got to thinking how far my state pension would go. But I’ll be back long before then. Hopefully holidaymakers will recall Tunisia’s considerable assets if and when the travel ban is lifted. Whilst I was there Thomson and Thomas Cook announced plans to resume flying in spring 2016, although that will, of course, be dependent upon a change in the FCO advice. And when that change comes, I’m sure that the Tunisian people will be as forgiving and welcoming as ever."